No Cost EMI on CC and DC.No Cost EMI on CC and DC. Extra Bumpup of 9000.Extra Bumpup of 9000. Futuristic, bezel-less design with a vivid display. Front earpiece not up to the mark. Vivo Nex is one of the most innovative smartphones available in the market. The device has motorized cameras making it possible to have a higher screen to body ratio. The smartphone has flagship level specifications, exquisite design, and massive battery backup. It has a two-day battery life which is just amazing. Vivo&apos;s custom UI feels like a rip off of iOS which destroys the entire experience. Vivo Nex is a flagship smartphone which comes with a true bezel less display. The device looks amazing thanks to the negligible bezels. For camera, the device has a pop up mechanism which works fluently. In the optics, the device is one of the best in this price segment. Overall, the entire user experience was at its finest. 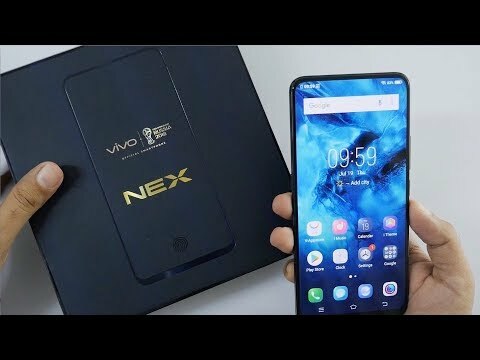 2 Pricebaba users have written their experience with Vivo NEX. If you own Vivo NEX, please do leave your feedback too. Lowest price of Vivo NEX price in India starts at Rs. 39,990 Vivo NEX is available on Flipkart at Rs. 39,990. Prices updated on 25th April 2019. Flaunting a 6.59-inch Full HD + Super AMOLED display, Vivo NEX comes with a screen resolution of 1,080 x 2,316 pixels. Thanks to its 388 PPI pixel density, the device boasts of impeccable clarity in the display and a fingerprint scanner which enhances the system’s security. Vivo NEX takes smartphone cameras to a new level with a dual rear camera system comprising of 12MP Dual-Pixel focusing primary sensor and 5 MP secondary sensor. On the front, the NEX is equipped with an 8 MP camera that promises great selfies. When it comes to performance, Vivo NEX is empowered with a Qualcomm Snapdragon 845 processor that clocks at 2.8 GHz. Combined with an 8 GB RAM, Vivo NEX spells enhanced multitasking. The huge internal storage of 128GB capacity compensates for the lack of external storage ability. A heavy-duty 4000mAh Lithium-ion battery lends the system solid backup. Coming to connectivity, the device supports the full range, including Bluetooth, Wi-Fi, 4G LTE, VoLTE, 3G, and 2G. Vivo NEX comes alive with FunTouch OS 4.0 even as it runs on Android 8.1 Oreo operating system.